An online survey of 1,074 adult Ontarians conducted from May 18th to May 23rd, 2018 shows the PCs with 36% of the vote, the NDP at 31% and the Liberals at 26%. Statistically, this is virtually the same as our previous wave of tracking conducted a week earlier with the PCs and NDP marginally higher and the Liberals marginally lower. This online survey was conducted on INNOVATIVE’s Canada 20/20 national research panel with additional respondents from Léger. The sample is weighted to n=1,050 based on Census data from Statistics Canada. While the horserace numbers are similar to the earlier results, key underlying numbers are showing significant movement. Despite the ongoing PC lead, there are some ongoing and growing PC weaknesses. The PCs are losing votes among Business Liberals and Deferential Conservatives. Negative views of Ford are growing. Business Liberals and Deferential Conservatives have a problem with PC leader Doug Ford. Only Populist Conservatives reject the idea he is unsuitable to be Premier. The impact of what people have read, seen or heard (R/S/H) is strongly negative for the PCs. 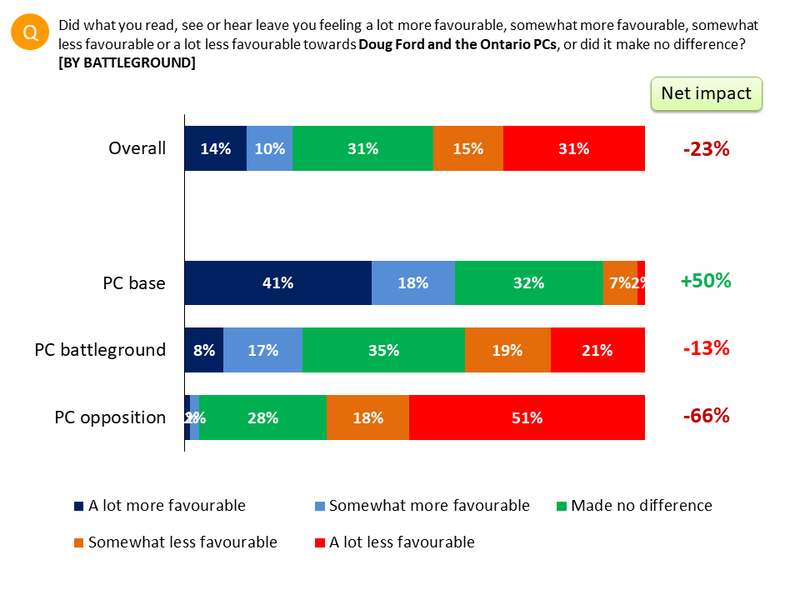 Though their base likes what they are hearing, the PC swing voters are less favourable as a result of what they have heard. While PCs have problems with more deferential centre-right voters, the PCs remain strong in this poll with economically and politically alienated voters. The PCs continue to lead in the 905 and in the North and East. We find a strong foundation underpinning the NDP vote. The NDP now have the support of more than half the core Left. While this group “should” be the most likely to vote NDP, in the last election it defected to the Liberals. Now it has come home from the Liberals and it seems unlikely to go anywhere else. Similarly, the NDP are now well ahead of the Liberals among Left Liberals, another group that is very comfortable with NDP policies. The NDP vote is regionally focused. They are tied with the Liberals in Toronto and tied with the PCs in the Southwest. Horwath has maintained her strongly favourable image. The NDP is the only party showing a net positive impact from the campaign communications dynamic. 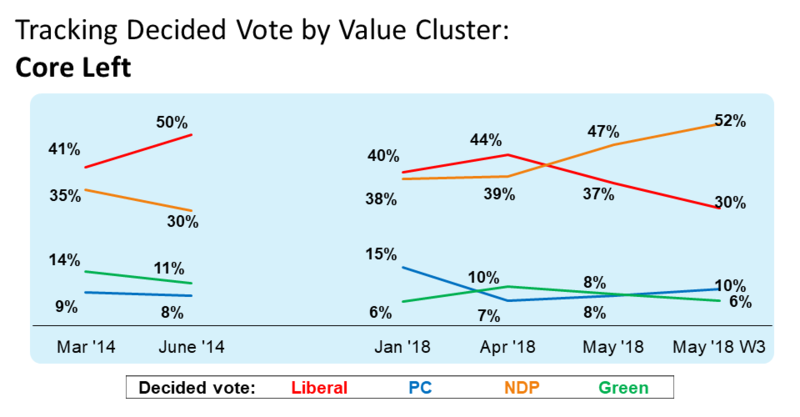 While more people are hearing negative news about the NDP than in the previous wave, NDP battleground voters are strongly net positive (+37) on R/S/H impact. We also find significant improvement in a key underlying dimension. There is a significant increase in the number of people who reject the idea this is a two-horse race. This was the move we saw immediately before the NDP rise in the Orange Crush of the 2011 federal election. Voters continue to turn their backs on the Liberals. Time-for-a-change sentiment remains high with more voters disagreeing the Liberals are the lesser of evils. The Liberals have a smaller pool of core voters and accessible voters than the NDP. The Liberals are leaving their swing voters with a more slightly more positive than negative impression from the campaign, but nowhere near the net positive numbers seen by the NDP among their swing voters. There are no signs of recovery in the Liberal numbers. For the full report please fill out the form below. These are the findings of a special Innovative Research Group (INNOVATIVE) online poll conducted from May 18th to May 23rd, 2018 with tracking drawn for our monthly Canada This Month survey. This online survey of 1,074 adult Ontarians was conducted on INNOVATIVE’s Canada 20/20 national research panel with additional respondents from Léger, a leading provider of online sample. The sample is weighted to n=1,050 based on Census data from Statistics Canada. The panels are recruited from a wide variety of sources to reflect the age, gender, region and language characteristics of the country as a whole. Each survey is administered to a series of randomly selected samples from the panel and weighted to ensure that the overall sample’s composition reflects that of the actual Canadian population according to Census data to provide results that are intended to approximate a probability sample. INNOVATIVE provides each panelist with a unique URL via an email invitation so that only invited panel members are able to complete the survey, and panel members can only complete a particular survey once. This is a representative sample. However, since the online survey was not a random probability-based sample, a margin of error cannot be calculated. The Marketing Research and Intelligence Association prohibits statements about margins of sampling error or population estimates with regard to most online panels. NOTE: References to May 2018 Wave 1 refer to our May 2018 Canada this Month survey in field from May 7th to May 9th, with a weighted sample of n=915 respondents. References to May 2018 Wave 2 refer to our first special online poll in field from May 9th to May 12th, with a weighted sample of n=1,500 respondents. The current wave of study is referred to as May 2018 Wave 3. Detailed tables: For all surveys, complete results as well as additional methodological details, are available in the full report.